Ponca City Regional Airport (IATA: PNC, ICAO: KPNC, FAA LID: PNC) is a city-owned airport two miles northwest of Ponca City, in Kay County, Oklahoma. Enrique's is a well known Mexican restaurant in the terminal. Scheduled passenger flights on Great Lakes Airlines to Denver and Dodge City ended in August, 2006. The service was subsidized by the Essential Air Service program. The airport opened in November 1938 with a single 3,600-foot (1,100 m) concrete runway. The United States Army Air Forces took over the facility in the summer of 1941 and used it as part of the British Flying Training School Program. This training was part of the Lend-Lease act where Royal Air Force flying cadets received a 20-week basic flying course taught by civil contractors. The Darr School of Aeronautics provided flight training. Fairchild PT-19s were the primary trainer at the airfield, but PT-17 Stearmans and P-40 Warhawks were also assigned to training. In November 1942, Royal Air Force training ended at Miami and the airfield became a primary (stage 1) pilot training airfield assigned to AAF Flying Training Command, Gulf Coast Training Center (later Central Flying Training Command). The civil instructors were retained under USAAF control by the 323d Flying Training Detachment. Pilot training at the airfield apparently ended on May 30, 1944, with the reduced demand for new pilots. The airfield was returned to the local government at the end of the war. Airline flights began in the 1930s, on Braniff. 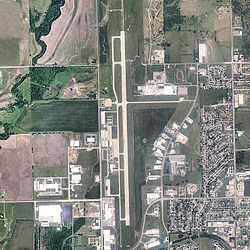 Ponca City Regional Airport covers 500 acres (202 ha) at an elevation of 1,008 feet (307 m). Its one runway, 17/35, is 7,201 by 150 feet (2,195 x 46 m) concrete. In the year ending August 26, 2008 the airport had 61,500 aircraft operations, average 168 per day: 93% general aviation and 7% military. 64 aircraft were then based at this airport: 91% single-engine, 5% multi-engine, 3% jet, and 2% ultralight. There are multiple hangars on the grounds, and the Northern Oklahoma Flight Academy is based there. ^ a b c d FAA Airport Master Record for PNC (Form 5010 PDF). Federal Aviation Administration. Effective April 5, 2012. Order 2002-7-2 (July 5, 2002): selecting Air Midwest, Inc., to provide essential air service at seven communities (El Dorado/Camden, AR; Jonesboro, AR; Harrison, AR; Hot Springs, AR; Enid, OK; Ponca City, OK; Brownwood, TX) for a two-year period at subsidy rates totaling $6,693,881 annually. Order 2004-6-12 (June 17, 2004): requests interested persons to show cause why it should not terminate the essential air service subsidy eligibility of Jonesboro, Arkansas, Enid and Ponca City, Oklahoma, and Brownwood, Texas, and allow Air Midwest to suspend its subsidized services at those communities as of October 1, 2004, when the current rate term expires. Order 2005-1-14 (January 25, 2004): selecting Air Midwest, Inc., to provide essential air service at El Dorado/Camden, Jonesboro, Harrison and Hot Springs, Arkansas, at a subsidy rate of $4,155,550 annually for a two-year rate term, selecting Great Lakes Aviation, Ltd., to provide essential air service at Enid and Ponca City, Oklahoma at a subsidy rate of $1,272,557 annually for allowing Air Midwest to discontinue its service there, if it chooses to do so. Order 2006-7-25 (August 1, 2006): terminating the essential air service subsidy eligibility of Enid and Ponca City, Oklahoma, and allowing Great Lakes Aviation, Ltd., to suspend service at the two communities as of September 1, 2006, if it chooses. This page was last edited on 24 January 2019, at 07:30 (UTC).